Quarterly capitalists should gird themselves for disappointment. With post-tax earnings running around 10 percent of national income, according to the Bureau of Economic Analysis, U.S. companies are close to the peak of profitability not seen since at least the late 1960s. 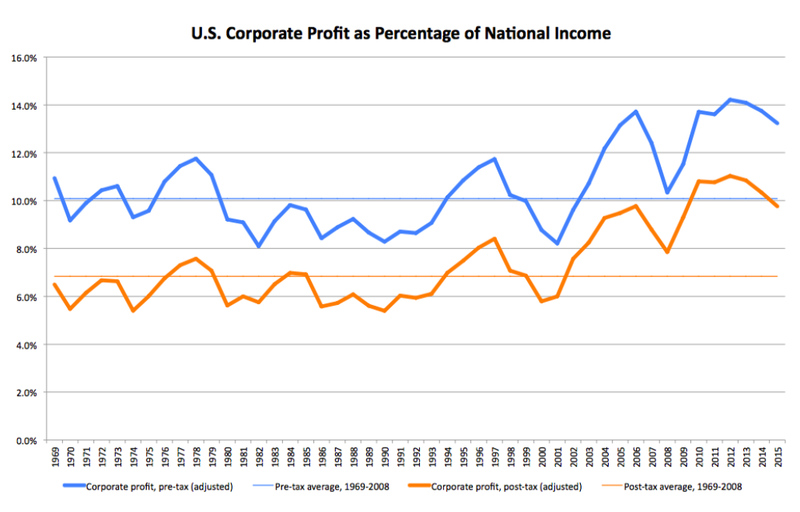 High levels of corporate profit are a global phenomenon, too. Competition, disruption and tax policy – not to mention weaker growth – are set to change all that. Worldwide, net income after interest and taxes increased fivefold between 1980 and 2013, according to a study published in September by the McKinsey Global Institute, not far short of doubling as a share of global GDP to 7.6 percent. The consultancy’s think tank foresees competitive pressure on margins from emerging markets like China. Fast-growing companies are starting to go global, and their tendency to be controlled by government or family interests may mean they can accept lower profitability in the short term than Western multinationals whose investors watch quarterly earnings closely. Meanwhile, though the profit pie has grown, gains have gone disproportionately to technology and other idea-driven sectors at the expense of traditional industry. That trend could continue, with even today’s biggest tech firms – the likes of Apple and Alphabet (formerly Google) – themselves potentially vulnerable to upstarts wielding new ideas. The MGI also notes that the scope to cut costs, for example the outsourcing of production to China by Apple and others, could be bottoming out. Borrowing costs, which have lingered at historic lows thanks to the world’s central bankers, also look set to rise. Slackening economic expansion is another factor. One consequence, the collapse in oil prices, is largely responsible for a plunge in the U.S. energy sector’s profit. As a result, analysts predict that overall S&P 500 Index earnings for 2015 will be a hair lower than in 2014, according to S&P Capital IQ’s tally on Dec. 16. They remain relatively optimistic, though, forecasting 8 percent growth in S&P 500 profit for 2016. That sounds bullish. Companies face other headwinds, including tax policy. The recent furor over tax-reducing mergers by U.S. companies – notably drugmaker Pfizer’s $160 billion deal with Allergan – is just one instance of authorities questioning whether businesses pay enough to governments. Investors who have gotten used to earnings ratcheting higher every quarter may want to reset their expectations.